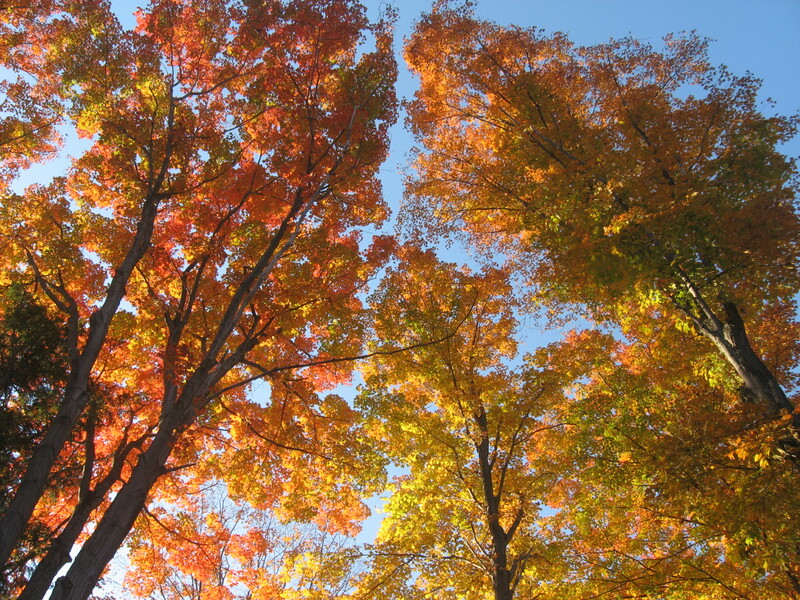 The trees, each fall, offered a vibrant display of colour. When I retired from the forces in 1967, Paula and I purchased a tract of land just north of Barrie and just west of Craighurst. It was on this tract of land – half maple trees and half field – where we spend nearly 25 years of our lives. It was here where our friends came to gather and we all grew old together. This property was the backdrop for all the animal and farming stories I have blogged about in the past. This was our oasis – it was our Walden Pond. There was no hydro, running water, or services on that piece of land. There was no house. What there was, however, was a rustic little cabin way back in the back with a dirt floor. And it was here where we moved while our house was being built on the land. It was here we stayed from July until early November – four of us, Grandpa on week-ends, and a dog. The cabin was small, but once the floor and bunk-beds were added it did in a pinch. We all moved in and got used to having no hydro, phone, cable, or … indoor privy. The out-house was only a small jaunt down the road – far enough for privacy, but not too far to make the jaunt onerous in the middle of the night. A small stream ran behind the cabin. My Dad, Jamie, and I set to work that summer trying to create a swimming hole by damming up the stream and digging out a depth from the mud where the water began to flood. There was a fantastic supply of fresh water springs that fed that stream so the stream-bed on the other side of the swim hole never ran dry. The frogs may have wondered what the heck was happening, but they were always kept well saturated. The swimming hole – aka Duff Pond, named after Walden, was quite a hit. I admit it was cold as it was spring-fed, and I’ll admit a bit muddy as there was no concrete base or clean pool liner to smooth things out, and I’ll admit there were a few critters who liked to join us for a swim including frogs, snakes, and fish… but all in all the pond was popular. I even rigged up a slide that the kids could climb up on and slide down into the pond. They had a blast. Our good friends would join us for a visit. The kids would, without hesitation, climb up the slide and zip down into the cold, muddy waters. They’d then haul off and hunt frogs, chase water spiders, and collect the swift little minnows. They’s always try to convince their parents that any one of these forest friends would make a good pet. On one occasion, though, the pond level dropped. I couldn’t figure out what was happening – there was no leak in our dam other than where the overflow fed back into the stream. But it was definitely lower than usual. If the problem wasn’t the dam itself, then it had to be up-stream. I took a walk. Sure enough I found the problem. I guess the beavers felt that if I could build a dam – they could build one better. And that began the battle of the dams. I’ll leave that story for another post! Funny how perspective changes all, eh? I think you and your family used to visit us in the woods – check with your mom. I know Bob maybe even helped my Dad build the cabin or make the syrup before the building was a “home”. 1. You posted a photo of the Luxury Green Cabin but not the Rustic one by the water, your Dad said there were photos of it somewhere in the albums. 2. I remember your dad telling me about shaving on the way to work with the electric shaver that he would recharge at the office. 3. Just realized who Donna is. I have a photo of the rustic one – but it needs to be scanned yet – alternatively – there is one that shows what the cabin looks like today… hard to identify it as a real cabin with the roof caved in. Will see what I can do – and hey, the green upscale cabin is getting a steel roof I think!